Opening Saturday 17th of March at 5 pm. 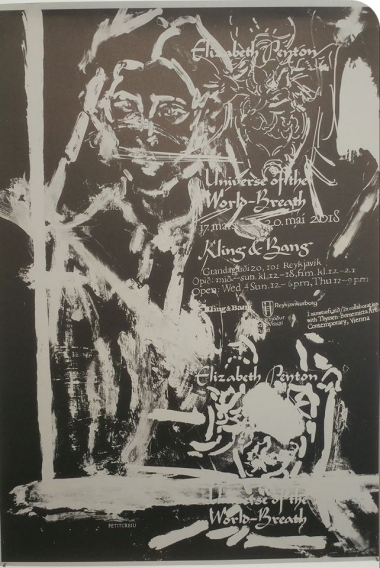 Kling & Bang Gallery proudly presents the first exhibition in Iceland by Elizabeth Peyton. There are nine works made between 2017- 2018 in the exhibition: two monotypes; one colored pencil and pastel pencil drawing; one watercolor; one soft ground etching; two oil paintings; one etching made through the gravure process and two linocuts. These pictures are all but one with a person or persons. They are of friends; Bella D’arcangelo age 8; Kristian Emdal and Antoine Wagner; a self portrait of the artist; two pictures of the Japanese figure skater Yuzuru Hanyu; a drawing made after Michelangelo’s portrait of Andrea Quaratesi; a scene of Belle collapsing in the arms of Le Bete from Jean Cocteau’s ‘La Belle et la Bête’; and a painting of flowers. These works were created from life, and or from the artist’s photos or found photos and the same re-photographed, moving pictures and memory. The Universe of the World-Breath takes its title from Markús Þór Andrésson’s essay in the catalog. Wenn Aug' in Auge wonnig trinken, Seele ganz in Seele versinken; Wesen in Wesen sich wiederfindet, Und alles Hoffens Ende sich kündet, Die Lippe verstummt in staunendem Schweigen, Keinen Wunsch mehr will das Innre zeugen: Erkennt der Mensch des Ew'gen Spur, Und löst dein Rätsel, heil'ge Natur! - English Translation When one eye another drinks in bliss, And one soul into another sinks, One nature in another finds itself again, And when each hope's fulfillment is finished, When the lips are mute in astounded silence, And no wish more does the heart invent, Then man recognizes the sign of Eternity, And solves your riddle, holy Nature! Born in 1965, Elizabeth Peyton lives and works in New York City and Europe. She studied fine arts at the School of Visual Arts in New York City and her work belongs to collections and museums around the globe. Recent solo-exhibitions include Éternelle Idole, Villa Medici, Rome 2017; Still Life, Hara Museum of Contemporary Art, Tokyo, 2017; Tristan und Isolde, Gallery Met, Metropolitan Opera, New York, 2016; Here She Comes Now, Kunsthalle Baden Baden, 2013 and Live Forever, New Museum, New York, 2008.